Octopus are different from squid. Squid don't live long and never get overly tough. Octopi, on the other hand, can live for years and get to be so tough they are inedible unless you know how to prepare them. The best way to do this is to braise them in their own juices over low heat for a very long time. This concentrates their flavor and renders them dense and delicious, not rubbery and off-putting. Even though there are several steps to this process, it's well worth it. Octopus is relatively inexpensive if you buy it at Asian or Mexican markets frozen. Buy either one big one or a few smaller ones. First, thaw the octopus in the fridge for a day or so. Then bring a large pot of water to a rolling boil. Don't bother salting it because you will not be cooking the octopus in the water very long. For baby ones that can fit in your hand, cook for a minute or two. For smaller ones about a foot long and weighing less than a half-pound, boil for 4 to 5 minutes. For large octopus (around 5 pounds), boil for a good 8 to 10 minutes. While the octopus is boiling, prepare a brazier or other heavy, oven-proof pot with a lid (a Dutch oven works fine) by lining it with a nest of herbs and spices. If you like Mediterranean food, use rosemary, fennel fronds, bay leaves, fig leaves, and fresh oregano. If you prefer Asian flavors, try lemongrass, ginger, Thai basil, and shallot. Think about the end dish and incorporate complimentary flavors here. Remember that the octopus meat will absorb the flavors you give it. Heat the oven to 200 degrees Fahrenheit. Take the octopus from the boiling water onto a chopping block. Chop off its head. There's not much good meat in there and what is there is incredibly gelatinous. You do not need to do this with the baby ones because they typically come cleaned with only the good meat from the head left on. For some reason, large octopi tend to be left whole. For small ones, check after 3 to 4 hours. For the big ones, check after 5 hours. 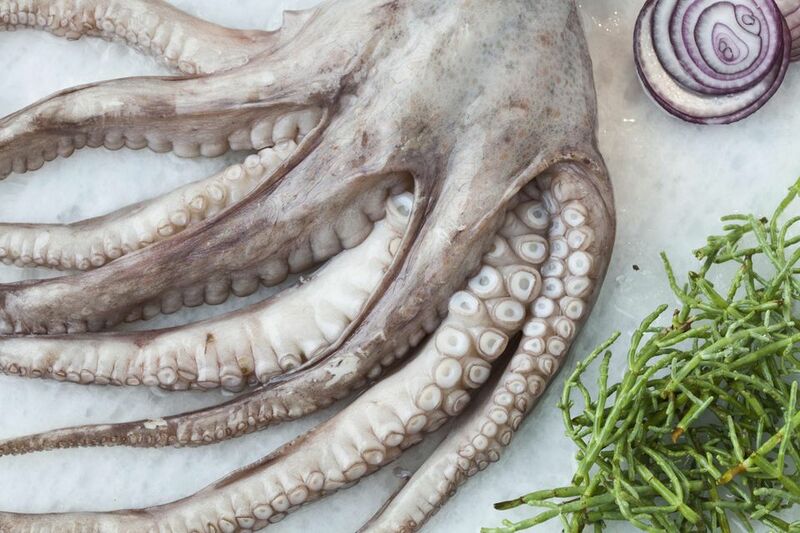 Once a large octopus is braised and cooled a bit, you will need to run your fingers along the legs to strip off any gelatinous fat that is on the outside of the legs. Do this under a stream of cold running water into the sink. The little ones likely will not have this fat. Braised octopus is ready to eat with only a little salt, olive oil, and lemon, but you can do all sorts of things with it. Chop it up for a salad, grill it quickly on the grill, or anything else. Cooked octopus keeps for a week in the fridge. Don't refreeze it. It will deteriorate once you thaw it again.